The news these days is weighing me down. Reading about the presidential primary circus, Panama Papers scandal, the Flint water disaster, and crooks galore leave me feeling like I've just eaten a couple of turkeys and the tryptophan has reduced my brain activity to the level of a member of Congress. 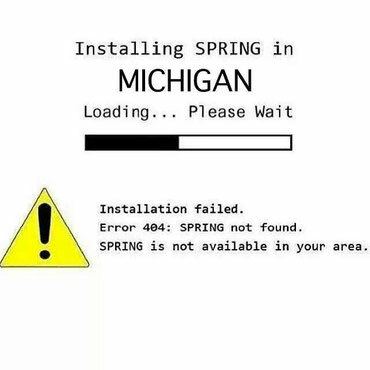 Ah, but now spring is upon us and so we are all due a break. It's time to take a breath and consider some lighter fare. Things that will not overwork our noggins. A sure sign of spring is the return of Detroit Tigers baseball. Even with the inevitable wailing an gnashing of teeth every time the Bengals insert a supposed “closer” into a game, it's still a sign spring has sprung. For those of you going to Comerica to see a game this season, you might be interested in what $20 will get you at a concession stand. Two 12 oz. beers and two hot dogs will run $18.50. CNN Money has a neat calculator that shows what $20 buys at every MLB park. See it at: http://money.cnn.com/interactive/news/economy/mlb-prices/. Another sports rite of spring is happening this weekend – The Masters golf tournament. What this means to those of us who live in Cadillac is that we have something to watch on television after we finish running our snowblowers. We'll get to listen to the PGA pros whine about how the “bitter cold” of 70 degrees and the “howling winds” of five mph have produced “brutal” conditions. This is after they have slept in their free hotel room, eaten a complimentary breakfast, driven to the course in a free car, hit a free golf ball, walked down the fairway in free golf shoes, and had their free golf clubs lugged by someone else (caddy). All of this will be described by announcers with British accents because announcers with American accents don't sound highfalutin enough. Finally, a few random news tidbits. If you plan on getting a tattoo and you want something original, you might want to avoid getting a Harley Davidson logo. Over 200,000 people around the world proudly display a Harley Davidson tattoo on their bodies. Fender guitars is the second most popular.